"I love and own the other games in this series, so giving this one a go was a no-brainer. Great to see Francois from the Delicious games put in an appearance too. Enjoyable game and would recommend other people give it a try -- especially if they enjoy the Delicious and Heart's Medicine games." Everyone’s favorite beautician Sally returns, on a mission to beautify women across the globe - all while searching for her long lost love. Business is booming, and Sally and her new side-kick François are making the town a little more beautiful, one treatment at a time. At least, they were - until some breaking news left Sally bursting with excitement. It turns out her favorite singer and long-time crush Julio will be performing his farewell concert near Snuggford. But what nobody knows is that Julio and Sally had a summer romance 20 years ago. Just when Sally's convinced they’ll be able to rekindle their romance, disaster strikes. Julio's plane goes missing on its way to the concert. Determined to find him, Sally and François set off on an incredible search. Will Sally find her long lost love? I absolutely love this game. Full of excitement. Great action and story line is awesome. 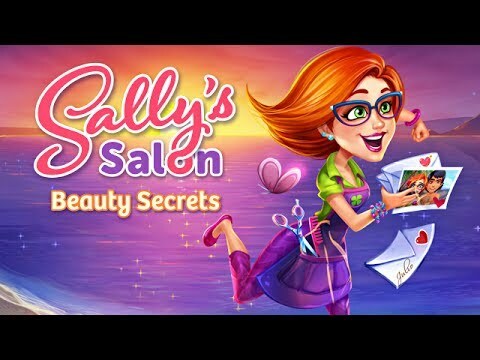 All of the Sally's Salon games are must haves. Keep the games coming. I think I have played them all. I love this game because it has all my favorite game characters -- Emily from the Delicious games, Sally from the Sally's Salon, and even Paige and Patrick from the Delicious games! It's fun and fast and great. I love this game! This game reminds me of Delicious but it's on another level. I am hooked already. This is a definite keeper. I really enjoyed playing this game. It was full of surprises and adventure. Sally reminds me of a person who goes after what she wants, no matter what! Much better than the original. Colorful, easy to play, better background scenes -- and the music, although different, still has a hint of the original. This was as good as the Delicious Emily games. Hope they make more. So addicting, hard to close out. It isn't a new game but the story line is. Other games are incorporated and if you played similar task type games, you will recognize these other characters. Very cute game and challenging at times. This game is very fun to play. Keeps your attention. Good time management game. The graphics are also very good. The game does not lag in any way. I so loved playing this game. It was so awesome having characters that you know from the music industry, like solving a mystery. It is a lot of fun and challenging. It has great graphics and beautiful colors. I love the characters.